In the last several years, pace-of-play has been an increasing issue in the golf world. 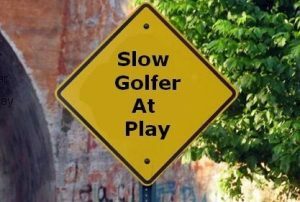 Slow play has contributed to the decline in the number of golfers. Many have simply quit the sport because of the time factor involved, which averages more than five hours on a weekend. A recent survey by the United States Golf Association revealed that the ideal length of time for a round of golf was 3 hours 54 minutes. However, the 5-hour threshold was the point at which golfers report a round to be too long, thus taking away from its enjoyment. 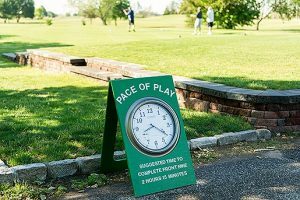 The survey also showed that nearly a third of all golfers reported that the most significant factor contributing to slow play was waiting for the group in front of them. Every golfer can do their part to speed up the game. Here are several suggestions to shave time off your next round of golf. • Get to the golf course early so you can stretch out and take a few practice swings and practice putts. You’ll find your game improving because your body is loose and ready to play, as opposed to using the first few holes for stretching and getting into the game, which takes extra time. • Don’t spend too much time looking for a lost golf ball. I use the 30-second rule: If I can’t find my ball within 30 second, I play another ball. • Play ready golf. Make sure all golfers in your group agree on this. Golf etiquette dictates that the person farthest away from the hole hits their ball first. To speed things up, ready golf means that if you are ready to hit, then you play your ball. If you’re not playing in a tournament, this is a great way to speed up the game. • Throw your ego out the window and play the appropriate tee box. You will enjoy the game much more if you are teeing off from the box your skill level dictates. And your scores will improve! One final statistic to ponder: If each player in a foursome took just five second less per shot, the group would shave 25 minutes off a round! We all can improve our pace of play in 2018. Let’s make it a great year! One more tactic. If you are close enough to chip on to the green, then also bring your putter when you leave the cart/bag. Saves walking back and forth. My wife and I play slow. We walk 9 holes. We’re retired and done with having to rush though life. We play the slow times during the week when others are working AND those who are off are at lunch to minimize our impact. If you come up to us we welcome a “play thru” – even multiples. If you play like us, support play-thru’s. Relax and enjoy the beauty of it all. PS, I get a good laugh at those of you in a golf cart playing by yourself complaining about slow courses. I agree w/ Dave. If you’re slower than a golfer/group behind you, let them thru unless you’re stuck behind another group/groups. Or have the golfers behind you join in if you’re less than a foursome. Takes away the pressure of having a group waiting and watching your every shot. Remind impatient players that if they were really any good you’d be watching them on TV on Sunday instead of playing wherever you’re trying to enjoy a round. Looks like Dave and his wife know how to enjoy life! My wife and I play slow golf also and enjoy the great outdoors around us. We also like to take a little break between 9’s to have lunch. We always let other players play through. We can’t figure out why people want to hurry and get through playing a round of golf and not enjoy it. The people that are giving golf up because of slow play probably wasn’t enjoying it anyway. I used to think that a game of golf was for relaxation, not a hurry up I want to get to the clubhouse game. Obviously, most golfers don’t think along those lines. It’s an ‘ I want to get there yesterday mentality’. I always let players that catch up to us to play thru. This way you make friends and it maintain everyone’s fun factor. Another way to move along is forget all those practice swings, my golf friend takes forever and it never helps! Being a starter/ranger I see everything but on the first few holes give everyone time to get into their groove, usually later in the day is more open, most importantly do you want to play golf or drink?